You there! Are you a Chinese male born sometime in the 1980s? 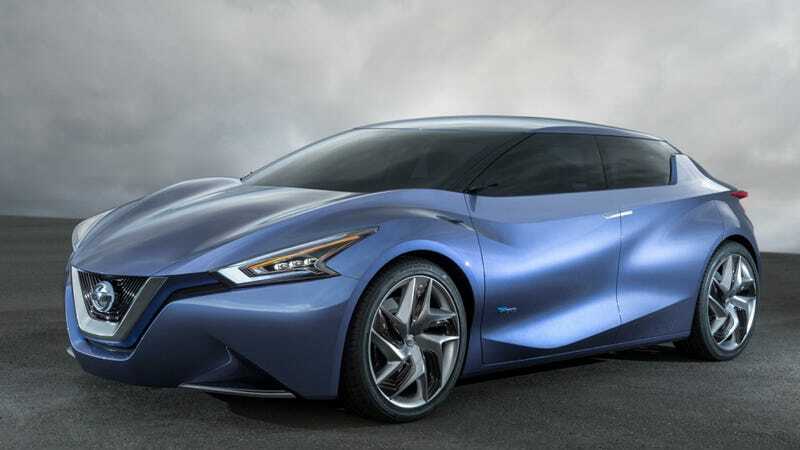 Then the Nissan Friend-ME Concept wants to be your friend. It's in its name and everything. Nissan dropped this stylish design study concept at the Shanghai Auto Show today, and they say it's aimed at "balinghuo" — young people in their 20s and 30s, specifically males. The four-seat car is pitched to young people who have made social media in China a vibrant community, as well as a massive business. For example, if one passenger sees something “cool” on his or her smartphone or tablet they can “throw” it onto common screen in the car so everyone can see it, he said. “They grew up without brothers or sisters so the time they spent with their friends is really important to them,” said (Nissan executive Andy) Palmer. No word on whether it comes with an on-board censor to keep from running afoul of Chinese authorities. Nice little zinger at the end there, Journal. Aside from that, I think it's kind of cool-looking. We've seen similar stylized headlamps on the Maxima and 370Z, and the grill from the Resonance SUV concept that bowed at the Detroit Auto Show. Would anyone care to become friends with the Friend-ME?